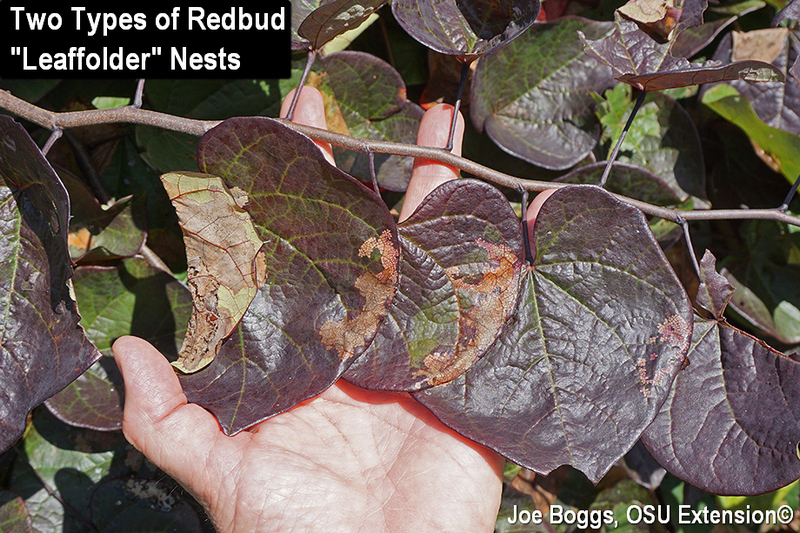 Participants at last week's Greater Cincinnati Diagnostic Walk-About were thrilled to view the unusual leaf symptoms caused by the Redbud Leaffolder (Fascista cercerisella; order Lepidoptera; family Gelechiidae) on its namesake host. Or, maybe it was just me who was thrilled. While populations are not as high as in 2016, it is not uncommon to find redbuds with leaves turning brown after being folded over or "glued" together. I'm not aware of any host preference studies for this native moth; however, the damage has always seemed more evident on weeping redbuds. Of course, this could simply be due to the damage being more obvious because of the vertical orientation of the leaves. The leaffolder caterpillars produce nests described by their common name by using silk stitching to fold over leaf edges. However, the nonconformist caterpillars also make nests like those produced by a "leaftier" by stitching together neighboring leaves. In fact, in my opinion, the high frequency of tied-together leaves challenges the correctness of the caterpillar's common name.